Sola Solarin is a pharmacist with MBA and practices as a Market Entry Strategist for Africa. 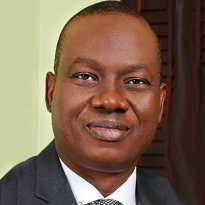 He is the Managing Partner of Savante Consulting Ltd, a Regulatory Affairs and Commercial Advisory practise operating out of Lagos, Nigeria, but with operations that cover all of sub-saharan Africa. Currently the Vice-President of the Industrial Pharmacy..